Researchers from the University of Oxford are using the largest, most intense lasers on the planet, to for the first time, show the general public how to recreate the effects of supernovae, in a laboratory. Witnessing and getting to grips with these experiments can help people to understand the inner workings of the Universe.Their "How to make a supernova' exhibit will highlight how lasers like Orion can help us understand and appreciate the origins of the universe. 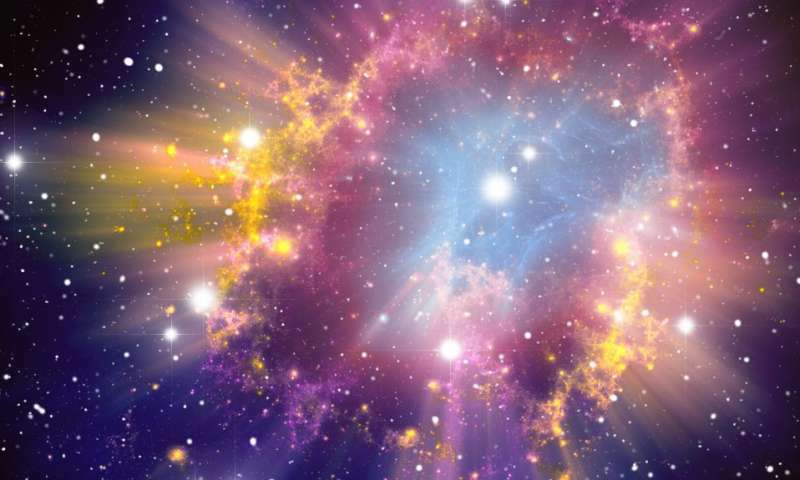 Dr Jena Meinecke, Junior Research Fellow at the University Oxford, said: "Lasers are so powerful today that we can actually recreate aspects of tiny supernovae that could fit in the palm of your hand! This allows us to answer fundamental questions such as "What is the origin of magnetic fields in the universe?" Imagine the possibilities. "Our research is helping us better understand some of the most powerful natural processes known to humankind, and more importantly, the origins of our universe." Professor Justin Wark, Director of the Oxford Centre for High Energy Density Science (OxCHEDS), said: "The Royal Society Exhibition provides an excellent platform to tell the public about the exciting research that is going on in the field of laboratory astrophysics—in particular it is a great opportunity to enthuse young people, who will be the next generation of scientists." More information: The 'How to make a supernova' research will be on display at the Royal Society's free annual Summer Science Exhibition until 9 July.